Today is Thanksgiving Day in America, a day of gratitude and appreciation for the gifts we receive each and every day. 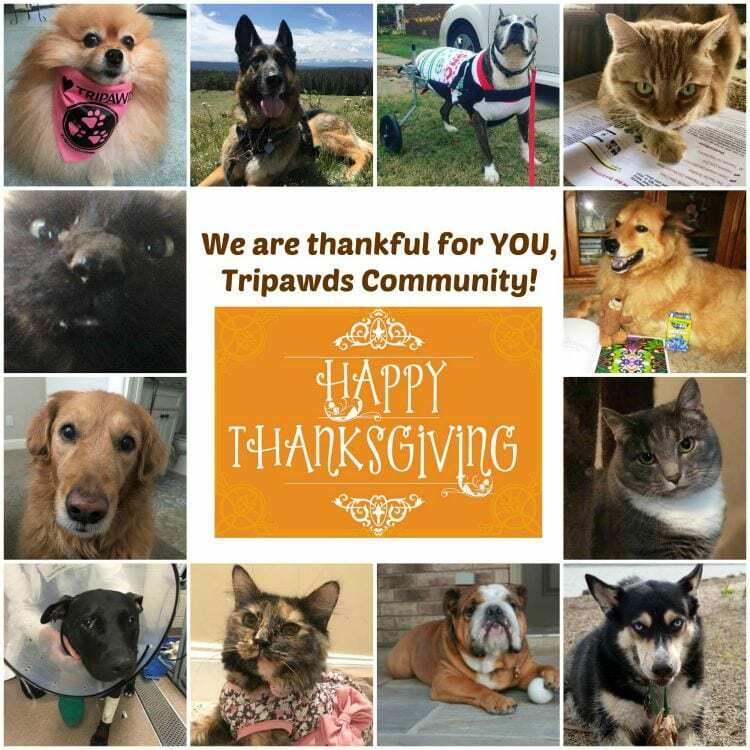 Here at Tripawds, we have much to be thankful for, like YOU! Thankful for Our Tripawds Friends! You make this community so special! We don’t say it enough. You, Tripawds friend, are the magic that makes this community thrive. Thank you! All your Tripawd stories, the Forum posts you write and the wisdom you generously share with new members is what allows this community to be there for worried pet parents. When a veterinarian like Dr. Sue Ettinger says Tripawds is the best resource about life on three legs, it’s because of you that we receive such a high honor. To every single person and pet who has joined us since 2006, we thank you for being here. Together, we can all help dogs, cats and even chickens to get another chance at living the good life after an amputation recommendation! First, know that everyone who participates in our Discussion Forums or generously provides ongoing financial support in some way is already doing such a great service! No need to do more. We are so grateful for that help! Did you know that every purchase you make through our Tripawds Amazon blog affiliate links will contribute a small amount that helps offset the expenses of running this community? It’s true! Pet or people products, every time you make a purchase you are contributing if you live in the U.S., Canada or the UK. And don’t forget, the Tripawds Gear Shop is the best place to shop for Tripawds and quadpawds alike! Whether you walk on a treadmill or walk in your neighborhood, log your miles between today and (November 22, 2018) and New Year’s Eve, and your participation in The 2018 Walk or Run for Tripawds Foundation Virtual Race helps raise awareness and encourages people to donate to Tripawds Foundation. You don’t even have to walk, you can just support #TeamTripawds with a donation! If you are able to donate to Tripawds Foundation to help us continue programs like the Amputation Surgery Assistance Program, feel free to make a tax-deductible contribution any day during the holiday season and beyond. Every amount helps, no gift is too small! We know you have a lot of great causes asking for your support during this time of year, and we are so thankful for whatever you can do to support this community. Thank you from the bottom of our hearts!